yes, so concern over the natural disaster but so mad aver the flood issue. In my opinion, the city arrangement is terrible and the officials don't seriously get into it. It seems like Indonesia has been beset by many disaasters and tragedies lately. Wishing all the best for the victims and families that are affected. Very sorry to hear about the situation in Jakarta. It is indeed very sad. I'm sure many prayers are with you and your countrymen. You did a wonderful job with the witch and how can you even say it is easy?! Hahah! nice tracing and cutting done. Watched the news, Yogjakarta is affected most is it? is it near to Jakarta? Hope all the victims received the necessary assistance from the government and the public. @tatabonita : Thanks a lot Tata! Glad to hear that your relatives in Sleman are all okay. Hope no more disasters in this country. Feel awful to see on the news. Yes Lia, I read in the news about the disaster in Indonesia. I'm sure God will bless them. I was very unsettled when I´ve heard about the situation in Indonesia. Very glad your family is ok. I send my strength to all people affected by the disasters. Your witch is s amazing! Did you cut with a knife? OH, MAD skills! Joining your prayers for the victims of the earthquake and I'm so releived you and family are safe, dear Lia. 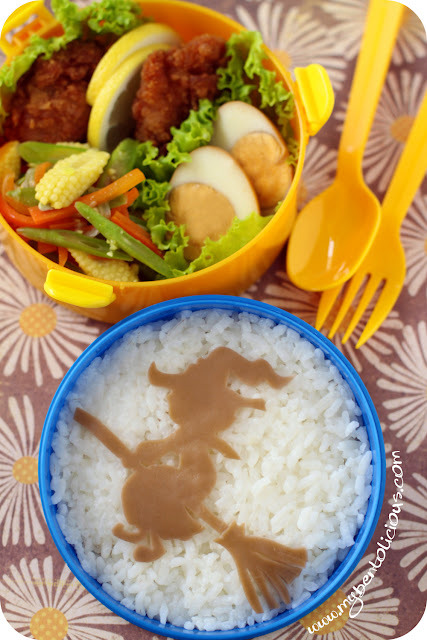 Wonderful details in this delicate witchy bento, you have such amazing cutting skills! Oh I just love your bentos. I look forward to seeing them. You did such a great job on this one. It looks like an intricate design to cut out too! @Kelly Polizzi : Thanks a lot Kelly! Sorry to hear everyone going through such hard times, I'll keep the victums in my prayers! You can tell you spent a lot of time and effort in your intricate witch! Very nice job. @Lyndsey : Thank a lot Lyndsey! Really appreciate it. Aw Lia, so sorry to hear about all the devastation in Indonesia.. One after another, it's really sad to see and hear about. I hope & pray everyone survives this.. Hoping you are okay as well..
Great bento ... you make it sounds so easy Lia, but I am not sure if I can do that ... you are very talented!! Haha..the witch sillhoutte is so nice and neat! The bento have so many variety of foods, yummy! Yeah, so sorry to hear that so much natural disasters happen in your country...pray and pray for the victims, hope all bad thing will over very very soon. God bless! Wow! I like your witch shadow! what a simple but very striking silhouette! this stylish bento is a little bit more "grown up" but still has lots of fun halloween spirit!